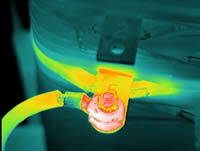 Qualitative thermography is an invaluable tool for detecting thermal patterns that often precede failures within operating electrical and mechanical systems. Once an exception has been thermographically detected, temperature measurement can be used to help evaluate the condition of affected component. Temperature measurement can also be used to evaluate components that appear to be operating normally. This short course will cover the application of temperature limits for electrical and mechanical equipment as well as several methods for determining repair priorities. This material is intended for anyone wishing to understand how to properly apply temperature limits to operating electrical and mechanical equipment. Course is designed for beginners and experienced thermographers, electricians, mechanics, and facility managers.